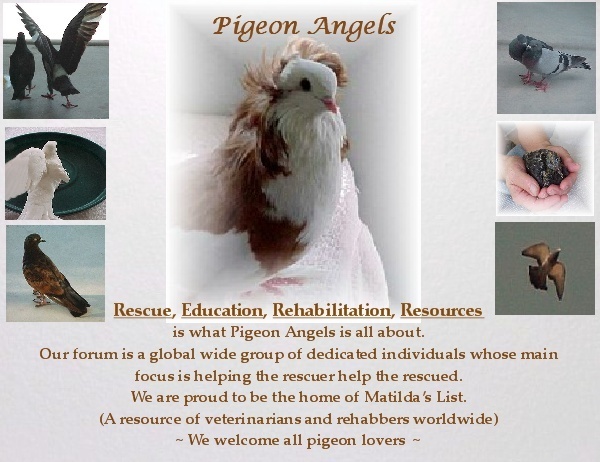 Are there any members on the forum from Australia, Sydney, who could advise/help out a member of my forum, French lady just landed in Sydney, who found today a pigeon with (propably) a broken wing and foot injury?? Myriam, Lapalomatriste Sanctuary for disabled pigeons, Catalunya Spain. We don't have anybody near that area, but I'll contact the two we have in Australia, give them the link to this post and ask if they have any contacts near Sidney. It's really difficult to find rehabbers in Australia, as the law there doesn't allow people to rescue and rehab ferals, but fingers crossed! As I'm in Melbourne I'm about 850km too far to be of much help. But, I have known from experience that Balmain Vet will go to serious lengths (usually) for a pigeon and has contacts that would potentially be able to help in the longer term. It's not a perfect solution by a long way, I'm sorry for Australia's backwards laws. It's even hard for pigeon people here to find other pigeon rescuers as people are reluctant to put up their hands. I'm so sorry he didn't make it, Myriam! Poor little thing must have been very badly injured, but at least his last hours were made safer and more comfortable. Please thank Aliciah for trying her best to help him; an act of kindness like that is a blessing for the rescue and the rescuer, and I wish her every happiness. Subject: Re: Help!! !Any members from Sydney?? ?